Abstract This project has produced a working inventory system for the Auburn University Department of Foreign Languages and Literatures Multimedia Center. The produced system is called the Foreign Languages and Literatures Multimedia Center Inventory System, abbreviated as “FLLMMCIS” or simply “IS” within the context of this document for brevity. The IS facilitates the Multimedia Center’s inventory lending activities. The system is a database-driven web site that has been written in ColdFusion backed by a MySQL database. This paper introduces readers to the system and details its development. In this paper an overview of the IS from a functional perspective is offered followed by the details of the project and a brief conclusion. 1. System Introduction and Walk-through The inventory system (IS) facilitates the operation of the Department of Foreign Languages and Literatures (FLL) Multimedia Center (MMC) library. The primary goal of the library is to provide lending services of multimedia assets to students, faculty, and staff. The system facilitates lending by tracking the status of the library inventory and enables users to perform related business activities. The users of the inventory system are MMC employees. They use the system to maintain an accurate inventory, document lending activities, and administer MMC library policy. The FLLMMCIS is a database-driven web site. The site is organized into two sections. The library section provides the user with all of the primary functionality for which the system exists. The administration system exists to support the operation of the library section. Users operate within the library section for all day-to-day activities, and use the administration section for special-purpose and occasional activities. 1.1 Library Section The IS accessed through a web browser. The login screen prompts users for their username and password. Upon login the users are taken to the main page of the library section. The library section is where “normal” system functions are accessed. Checking in and out items and maintaining the inventory are the most common activities. For these activities, large links are provided in the main content area. On the left, a menu allows for direct access to all library activities, and at the top left, a tabbed menu allows users to navigate between different areas of the system. 1.1.1 Checking Out Items There are several common scenarios for checking out an item. A number of different functions are provided to facilitate each scenario. However the checkout process is executed, the process requires that the desired items be added to the checkout cart. During the checkout process the patron will sometimes provide only the title of the item they wish to check out. The user can search for the item using the “View/Search Library” page. On this page, users can search for items and view matching results. When the desired item has been found, it can be added to the checkout cart by clicking corresponding cart icon. If the patron supplies the item ID, the user can use the “Check Out an Item by ID” page. The user enters the item ID and clicks the “Add Item to Cart” action button. The item is then added to the checkout cart. After all the desired items are in the checkout cart, the user selects the patron by navigating to the “View/Select Patrons” page or by taking the “Select a Patron” action found on the checkout cart page. On the “View/Select Patrons” page as seen in Figure 1.4, the user selects the patron from the list. If the user has taken the “Select a Patron” action from the checkout cart, then they will automatically be returned to the checkout cart. After selecting the duration for the loan, the checkout is completed with the “Check Out” action. 1.1.2 Viewing Item Details From several pages where item IDs are displayed, users can access the Item Details page by clicking on the item ID. This page provides a complete description of a single item. From this page, users can select to edit or delete the item they are viewing. If available the item can be added to the checkout cart. In Figure 1.4, the item being view is checked out, so the “Add to Checkout Cart” button is disabled. 1.1.3 Checking In Items The “Check In Items” page displays items that are currently checked out. Users select the item or items they wish check in by selecting the corresponding check box. The user then takes the “Check In Marked Items” action to complete the check-in. 1.1.4 Sending Overdue Notices Overdue notices can be sent to patrons who have exceeded the period of their loan. On the “Send Overdue Notices” screen, a list of users who are borrowing overdue items is displayed. The items that are overdue are also displayed. The user can select to send an overdue notice to some or all patrons by selecting the corresponding checkboxes and pressing the “Send Overdue Notices” button. 1.2 Administration Section The administration section provides functions that are not directly related to day-to-day operation of the library. Activities that are performed only occasionally and that are related to the operation of the system, rather than the library, are performed within this section. Such activities include editing database tables, managing system users, and viewing system reports. 1.2.1 General Database Access In the General Database Access area, any table in the database can be viewed or manipulated through a standardized interface. Common activities in this area include adding new item formats and adding terms. 1.2.2 Managing Users The “Manage Users” page allows users to be added or removed from the IS. This page also allows user classes to be assigned. These user classes are used by the access control system to determine if a user should be allowed to use the various functions of the IS. Users cannot remove themselves from the system. This prevents users from accidentally locking themselves out. many items are overdue. Two graphs display the all-time usage and the usage over the course of a semester. 2. Project Details In this section many details related to the project are discussed. A description of the customer and of project deliverables is offered. Engineering details including requirements collection, modeling, testing, and deployment are also addressed. Literatures (FLL) to FLL students, faculty, and staff. The facility is located in the Haley Center at Auburn University. It consists of a computer lab and a computer-equipped classroom as well as areas dedicated to social language learning. An inventory of media and equipment is lent to faculty, staff, and students to provide relevant materials and technology to language students and educators. This facility is operated by the MMC Director and a staff of student workers. This group is the user-base of the IS. 2.2 Project Deliverables There are a number of deliverable artifacts for this project. The two primary deliverables are the web site and the database. The web site consists of a directory structure containing ColdFusion files and graphics. This structure is in place on the system web server. The MySQL database exists in complete and functioning form on the MySQL server. Two documents are provided to support users and maintenance personnel. The user manual provides instructions for operating the IS. Common topics of interest are addressed with examples and step-by-step instructions. Users unfamiliar with the system can reference this document and begin operating the system without formal training. Users should have a working knowledge of MMC policy and be familiar with using a web browser. Technical documentation is provided as a reference to installers and maintenance providers. This documentation describes the architecture and operation of the system at the technical level. Installation, backup, and restoration instructions are also provided in the technical documentation. This document is intended for web programmers who will service the IS. Some artifacts from the development process will also be delivered. Among these are the scripts that create and migrate the database and several design artifacts. The database is built by a BASH script. The shell script assembles a MySQL script from a directory structure containing scripts for each table. It then executes the assembled build script which constructs the tables for the database. Another BASH script performs similar actions for migration. A similar directory structure containing migration scripts is assembled and executed to migrate the data from the old database to the new one. These scripts are not of any immediate use to system users or maintenance personnel, but provide a record of and insight to how the system was created. Design artifacts are provided for maintenance purposes. The requirements document, testing document, the UML object model, and database model are provided in stand-alone digital format. These artifacts may be useful for updating and maintaining the system. They are also included in the technical documentation for reference. 2.3 Requirements Collection and Refinement The old inventory system is the source for many of the core requirements. In the previous system, items could be added and removed from the inventory, updated, lent, and returned. The previous system was in service for several years, and during that time, many desirable and undesirable attributes were identified. I gained valuable experience with the old system while I worked at the MMC. During that time, I performed business activities using the system and acted as a maintenance programmer. In this regard, I am an expert on the old inventory system and am familiar with its use, strengths, and weaknesses. Through my experience, I identified many shortcomings of the old system. Consequently, many requirements were identified as changes that should be made to the old system. The MMC director also used the old system frequently. The director formulated a list of requirements for the IS based upon her experience and provided me with that list. The system was conceptualized through an early prototype which was discarded. Through prototyping, further requirements were identified and added to the growing collection. The requirements were expressed in a hierarchical outline and refined incrementally. The MMC director periodically reviewed the requirements offering suggestions, clarifying requirements, and identifying new requirements. 2.4 Modeling and Design Modeling was an important part of developing the IS. The database model was developed early in the project and was used for reference repeatedly during interface design. The object library originated as a prototype to examine the possibility of producing a reusable subsystem for database interaction. That prototype and the reuse concept were abandoned when the complexity of the subsystem became overwhelming. After attempting a page-by-page approach it became clear that the system produced would have serious maintainability issues. At that point I decided to reconsider a reusable system and began modeling the object library in UML. The object library is of sufficient complexity that I do not believe it could have been produced successfully without the model. document. This document contains many specific tests that originated from bugs found during the development process. Whenever a fault was discovered that did not correspond to specific functional requirement, the requirements were revised, the problem was corrected, and a test was created to verify the correction. To deploy the IS, first the user interface was put in place on the web server. Next, the database was constructed. Finally the data was migrated from the current version of the old database. To transition to the IS, users simply stopped using the old system and began using the new one. The IS will be maintained by Multimedia Center and College of Liberal Arts Information Technology staff members. A technical guide gives an in-depth explanation of system operation and comment-based documentation provides an even finer grade perspective. With these aids, maintenance personnel should be adequately equipped to repair defects or extend/alter the functionality of the system as requirements change. 3. Implementation The IS has been implemented using a number of technologies. ColdFusion and various web standards were used to develop the user interface and the database has been created in MySQL. In this section, some of the technologies used are introduced, the architecture of the IS is described briefly, and the implementation of the user interface and database are discussed. 3.2 Architecture The IS is deployed across two platforms: a web server and a database server. The web server is a PC running the Windows Server 2003 operating system and Microsoft’s Internet Information Services (IIS) web server. The implementation of the IS is not tied to either this operating system or to the IIS web server. The web server also runs Adobe’s ColdFusion 8. The IS is written for ColdFusion 8 specifically and will run on any web server that is compatible with that system. The MySQL database server is run by OIT as a service for official university applications. custom tags. The syntax mimics HTML and allows the programmer to produce ColdFusion code that incorporates neatly with HTML. Figure 3.1 is an example of two calls to a custom tag. Both of the bracketed “cfmodule” elements call the custom tag. The opening tag states explicitly the file which should be executed. ColdFusion determines which file should be executed by the closing tag element by parsing the script and pairing matching tags. Figure 3.2 shows the contents of the custom tag being called. The “thisTag” scope is provided by the ColdFusion server automatically. The server sets the “executionMode” variable based upon the context of the call. So, this tag’s execution is conditional upon the context in which it was called. tables required by the IS. After the database is created, another collection of MySQL scripts migrate the data from the old database to the new. The database is solely responsible for representing the state of the library and is the only way in which data is stored within the IS. 4. System Composition The IS can be considered to consist of three major components: the user interface, the object library, and the database. The user interface and object library are closely related. The user interface is specific to the IS while the object library has been designed to exist independently. For this reason, they are addressed separately here. aesthetics, interface design activities for this project pertain mostly to the many forms used throughout the system. Form design is addressed carefully throughout the IS. User-friendly forms can make the difference between a system that is embraced or abandoned. Best practices applied to forms can increase completion rates and overall success. Forms should require the minimum input from the user to achieve the business goal. Consider the forms in figure 4.1. On the left, the traditional solution is a set of radio buttons and a submit button. This form requires both selection and submission actions from the user. With the form the right, the user can make the selection with a single action. Where possible, users can interact with the IS using single actions. A well-designed form provides a clear and intuitive path to completion. The user should be able to identify what actions must be taken to complete a form easily. The alignment of field labels and placement of input fields can assist users to that end. In figure 4.2 “Add Item” page uses right-aligned labels and left-aligned fields. This makes the correlation of a label to its field clear. This also produces a straight and vertical path to completion that guides the user through the form to the “Edit Item” action. This form uses minimalist visual elements to separate input elements. A simple horizontal rule provides separation without creating distractions. Special attention is paid to addressing errors generated during form submissions. Fields in error in figure 4.3 are redundantly marked so that the problem can be quickly identified and addressed by the user. These fields are marked by a red error message describing the problem, the field labels are change to red, and an alert icon appears by the field label. The alert icon allows colorblind users to identify error fields. This redundant marking reduces user frustration by directing the user’s attention toward resolving the errors and completing the form with minimal time and effort [Wroblewski 2008]. 4.2 Database The MySQL database represents the inventory and is the repository for all IS data. In this section, the database development is discussed in three sections. First the design process is described followed by a discussion of the migration procedure. Finally, the composition of the database is examined. 4.2.1 Database Design Database design was performed by constructing an Entity-Relation (ER) model. This model was incrementally constructed and refined until it was satisfactorily complete. Eventually, the ER diagrams were abandoned in favor of a Microsoft Visio database diagram. This diagram is provided for reference in Figure 4.5. Special attention has been paid to the database design with respect to referential integrity. The use of normal forms can give assurances regarding referential integrity. First Normal Form is guaranteed by the exclusion of set-type values throughout the database. The database has been constructed to adhere as closely as possible to Third Normal Form. In an attempt to approximate Third Normal Form, relations have been decomposed as far as practical, many into trivial relations. In all cases, the attributes of relations are defined by only the key. The database as designed fulfills all related requirements and minimizes redundancy. The database uses the InnoDB storage engine. This engine supports foreign keys which are used by many of the relations in the database. The use of foreign keys allows much of the business logic to be abstracted from the web application and placed into the database itself. This reduces demands on the application developer and simplifies application code. Consider the case of an update to the Item_Formats table. If a user changes the item format from “Digital Video Disc” to “DVD,” the system should update all items with the format “Digital Video Disc.” Without foreign keys, the application programmer would have to enforce this constraint at the application level. With foreign keys, the appropriate updates are made to all items by the DBMS. Figure 4.1 is part of the create statement for the Items table. The “ON DELETE SET NULL” clause tells the DBMS that if an item format is deleted, all rows in the items table that refer to that format should be set null. Similarly, if a format is updated, the update is performed all items referring to that format. This situation is representative of many such cases. Programming this kind of database maintenance at the application level is tedious, increases code complexity, and potentially introduces errors. 4.2.2 Database Migration The majority of data which comprises the inventory system was previously stored in another MySQL database. That database was created by the authors of the original inventory system. It did not make use of foreign key constraints. It also contained data which lay outside the scope of the new system. It was necessary to move the data from the old representation into the new representation. This was done with a table-by-table approach. The order in which the migration could occur was dictated by the structure of the new database. Tables with foreign keys had to be created after the tables to which their keys referred. Many of the tables in the old database mapped logically onto their new counterpart tables in a one-to-one fashion. Other tables in the old database mapped as one-to-many into the new database. The old representation of items compressed much of the data pertaining to a given item into a single record. This caused some inherent limitations. Consider the example of a DVD. Many DVDs have multiple audio tracks and multiple subtitle options for various languages. In the old system, there was no facility for representing this information. In the new system, the Spoken_Languages and Subtitle_Langauges tables allow for an arbitrary number of associations between an item and the relevant languages. 4.2.3.1 Authorization and Access Control Tables The Components table contains entries that represent components of the web site. Tuples in the Access_Allowances table indicate which Access Classes are authorized to use website components. Access_Classes are the classes to which system users belong, and User_Classes tuples pair users with classes. The users IDs are stored in the People table. A relatively simple query can test to see if a user is authorized to access a component. This query will return the number of corresponding Access_Allowances rows that correspond to the given component and user. If the result is greater than zero, the user is of at least one class that is allowed to access the component and will be granted access. 4.2.3.2 Inventory Tables The Items table contains an entry corresponding to each item in the inventory. Some of the fields of the Items table are foreign keys that reference simple tables, but most fields are text. There are three tables that associate items with languages. They are Spoken_Languages, Subtitle_Languages, and Language_Sections. These tables allow for any number of associations of these types. 4.2.3.1 Inventory Tracking Tables The Check_Outs table stores records of item checkouts and has two foreign keys. One foreign key relates the checkout to the item and the other references the checkout duration in the Checkout_Durations table. 4.3 Object Library The object library is a collection of ColdFusion components that is used to produce a uniform method for interacting with database tables. These objects automate the process of producing forms and displays for database input and output. This collection of objects allows any table in the database to be accessed and altered. The objects in this collection are generic. They are not database specific. These objects can be used outside the context of this project to produce database-driven websites rapidly. There are several classes in the object library. The three core classes of the collection are FormTable, DataElement, and WrappedQuery. Other classes are not discussed here except in relation to these main three. 4.3.1 FormTable The FormTable class represents the interface object that allows users to interact with database tables. It is the gateway to accessing this collection of objects. To create the interactive tables found in the “General Database Access” section of the system, the programmer need only call one function and supply the target table’s name. The FormTable is created as well as the corresponding WrappedQuery objects and all other required objects as needed. The FormTable generates the display with which the user will interact. It is composed of Column objects, which are composed of DataElement objects. 4.3.2 DataElement The DataElement object represents the contents of the table cells. DataElement objects are never directly instantiated. Since the class is never instantiated, it might have been created as an interface, which ColdFusion8 supports with Java-like syntax and semantics. However, many descendants of this class benefit from inheriting non-abstract methods. So, DataElement serves as a parent class for the many type-specific classes by which it is extended. One such class is DateElement. This class is created whenever a database table contains a column of the MySQL data type DATE. Other similar classes exist for other MySQL data types. Some DataElement classes produce controls like buttons for the user interface. WrappedQuery, a collection of KeyElement objects represents the MySQL primary key, if present, for the target database table. Similarly, ForeignKeyElement objects identify columns that makeup MySQL foreign key constraints and AggregateElement objects handle foreign keys that are composed of more than one column. 4.3.4 Object Model Figure 4.8 is a UML class interaction diagram that was produced during development of the object library. It shows the classes in the library and the important relationships between them. The model of these objects was kept simple intentionally. The produced model provides adequate information about the objects. UML models with excessive detail confuse the reader and though they may be more complete, they can be less useful as tools [Arlow 2005]. 5. System Requirements and Solutions The IS is replacing an existing system. The primary reason for the replacement is due to a change in available resources. The Office of Information Technology (OIT) plans to discontinue operation of their PHP web sever. The old system was written in PHP and hosted on that server. The College of Liberal Arts has chosen Adobe’s ColdFusion as their dynamic web server technology. The redesigned inventory system is written in ColdFusion as it is the only dynamic web environment available to the customer. The use of ColdFusion as a development platform was the first requirement identified for the new system. In this section, selected system solutions are presented. These solutions are categorized as belonging to five groups: inventory tracking, inventory management, database and system management, business activities, and security. 5.1 Inventory Tracking The operation of MMC library is similar to a conventional book-lending institution. Materials are given to patrons for a period, with the expectation that they will be returned by a pre-determined date. The status of the library inventory must be maintained so that materials can be accounted for whether they are physically present in the library or not. When a patron borrows from the library, the system must record this event. Similarly, when the items are returned, this must be reflected in the system. 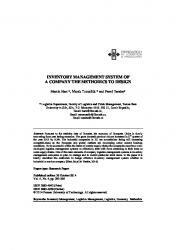 In this manner, the status of the inventory is recorded. These behaviors and capabilities are requirements for inventory tracking. These requirements are realized as checkout and check-in functionality. ID” page as seen in Figure 5.1. Because it will be used frequently, this page has been kept very simple to maximize efficiency by minimizing mistakes and distractions. The page uses a simple form to allow the addition of items to the checkout cart. Less frequently, patrons supply the user with other identifying information for the desire items. The patron may give a partial or complete title or a description of the item for which they are looking. In this case, the user must identify the item before it can be added to the cart. To facilitate identification of items, a search feature has been implemented on the “View/Search Library” page. A text search allows users to look for items matching the patron-supplied criteria. The text search attempts to match against item numbers, titles, and descriptions. Usually, the title is known. This being the case, a simple text search usually reveals the item in question, and more elaborate searches requiring changes to the search criteria are unnecessary. Considering this, the search and display options are hidden by default as in Figure 1.3. This frees screen real estate and reduces distractions for the user [Wroblewski 2008]. Should the user need to customize the search, many useful options are offered as seen in in Figure 5.2. The output from the search can be customized so that particular attributes are displayed or not. Results can be sorted by any field in ascending or descending order, and the number of results per page can be adjusted. These options can assist a user in identifying an item when limited information is available. specific system requirements. Understanding how the user will interact with the system provides insight into how to create a user interface that meets those requirements. The second most frequent activity for IS users is checking in items. The “Check In Items” page seen in Figure 1.7 allows users to indicate to the IS that an item has been returned. On this page, the user can see all of the items that are currently checked out. The item id, title, format, and item availability are provided to assist users in locating the item to be checked in from the list. To check in items, the user selects the checkboxes corresponding to the items and chooses the “Check In Marked Items” action. The appropriate entries in the Check_Outs table corresponding to these items are updated, indicating that the items have been checked in. 5.2 Inventory Management A core requirement for the IS is the ability to manage a dynamic inventory. Changes to the inventory are frequent and should require minimal effort. Users must be able to add, remove, and update items to reflect an accurate inventory. counter turns red. This draws the attention of the user to the counter. This helps the user understand why they cannot supply additional input and reduces user frustration. The “Running Time” field provides users with two ways to supply this input. Users may provide the time in hours and minutes or in minutes only. This capability removes the tedious task of manually converting a time in one format to another. It also removes the chance of an error introduced through conversion by the user. In the old inventory system, only one spoken language, one subtitle language, and one language section could be associated with an item. This limitation was imposed by the database structure used in that system. This was not a significant problem before DVDs became common. The DVD introduced multiple language and subtitle options, and the new database and system allow for any number of language associations for a given item. Items can be edited by clicking the “Edit this Item” action under the item detail view. The “Edit Item” page uses the same ColdFusion component as the “Add Item to Library Page.” Using the same form for both adding and editing items means that users perform familiar actions to accomplish either task. When adding or editing items, extensive input validation is performed. The “Item ID,” “ISBN,” and “Year” fields use regular expression matching for validation. When errors occur, rather than receiving a completion message, users are returned to the form. 5.2.2 Deleting Items Rarely, it is necessary to delete an item. Users can delete an item from its “Item Detail” page. The “Delete this Item” action brings users to a confirmation screen version of the item detail page see in Figure 1.10. The user is asked if they want to delete the displayed item and warned that the operation is not reversible. This form contains two actions. The primary action is to delete the item, and the secondary action is to cancel the operation. Normally, the primary action would be aligned in the vertical, left-hand path to completion. However, since accidental deletions are of greater concern than failed deletions, the primary action is moved off the path to completion, forcing users to take longer and positively confirm the action. 5.3 Database and System Management The user interface exists to provide a way for users to interact with the database. Those interactions realize the main goals of the system. However, there are other requirements that are fulfilled through database interaction. These requirements are related to maintaining the system, rather than supporting business activities. Almost every table in the database may require alterations and the user must be able to accomplish this through the user interface. These activities are called database management. For the IS, system management refers to adding or removing users from the system and setting user classes for access control. such updates were required, a user with direct database access and a working knowledge of MySQL was required to perform a simple update. One example is adding a language. On repeated occasions, materials would be added to the database, but their corresponding languages could not be found in the languages table. Non-technical staff could not make the required addition to the table, and the task would remain incomplete until the request could be submitted to a technical staff person who could perform the required database update. The ability of non-technical staff to make unforeseen updates to the database is even more critical now. The MMC no longer employs technical staff and instead relies upon College of Liberal Arts staff for technical assistance and maintenance. The new system provides a uniform method for database access. Any table can be added to, deleted from, or updated through the General Database Access section of the IS Administration area. 5.3.2 Managing Users The MMC staff changes frequently. Students work at the MMC on a semesterly basis, so changes to the IS user base are common. While this requirement could be fulfilled using the general database access functionality, a specialized interface makes the task easier. The “Manage Users” page seen in Figure 1.12 provides an interface through which users can be added to or removed from the system. This page also allows assignment of user classes. When users are added to the system, they have no user class. One or more user classes must be assigned so that the new user can access the various parts of the IS. Since these operations are so closely related, it is convenient for the user to find both on the same page. 5.4 Business Activities and Requirements There are two business related requirements for the IS. The IS must allows users to send overdue notices and produce reports useful for making business decisions. 5.4.1 Overdue Notices MMC library policy dictates that patrons who have failed to return borrowed items in the time allotted should be notified via email of the situation and prompted to return those items. The IS provides a simple way to send overdue notices. Users can elect to send notices to any or all patrons, and the notification emails are generated automatically with pertinent information. Before overdue notices can be sent, the system must determine what items are overdue. It is of particular significance that the due dates of items are not stored in the database. Due dates are calculated by the system when needed based upon the checkout_date and duration. For checkouts with a duration of two weeks, a MySQL query calculates the due date using the MySQL function ADD_DATE. For checkouts lasting until the end of semester, the IS determines the Term in which the item was lent and returns the end_date of that Term. The advantage to this strategy is that if the end of a term need to be adjusted, the due date of the item will automatically reflect that change. Alternatively, the due date could be calculated at checkout time and stored in the checkout record. However, since most checkout durations are until the end of the semester, that date would be stored redundantly for each checkout of this type. Calculating the due date avoids this redundancy. 5.4.2 Reporting One capability not realized by the previous system is the ability to generate reports relating to the inventory status or from historical usage data. The customer requires that reports, comprised of compiled statistics and figures, be produced on-demand. Such reports can be used to provide metrics for success, and such metrics may assist in the process of making business decisions regarding the MMC. The IS produces reports in the form of charts and figures that are collected and calculated from database records. Graphs of lending activity are generated for alltime usage and on a semesterly basis. The IS also produces charts displaying the composition of the inventory. 5.5.2 Security The two main security issues for the IS are authenticating users and controlling user access. User authentication is the process of verifying the claimed identity of a user. Access control refers to restricting users to particular system functions. OIT. In doing so, the system is not required to handle lost usernames and passwords or other related issues. This translates to reduced requirements on MMC staff and reduced complexity in the system. Furthermore, since the usernames and passwords are not store within the system, the level of information sensitivity is minimized. Another substantial benefit is that users do not have to remember a separate username and password to access this system. The Auburn Office of Information Technology (OIT) policy requires that any application receiving Auburn usernames and passwords use a secure method to protect login information. ColdFusion supports secure LDAP which satisfies this requirement [Active Directory Authentication]. The use of secure LDAP protects login information transmitted from the web server to the LDAP server. To protect login information sent from the client’s browser to the web server HTTPS is used. HTTPS is supported by the Internet Information Services (IIS) web server. This protocol uses the public key encryption protocol Secure Sockets Layer (SSL). This protocol is widely used throughout the web for secure transactions. The only sensitive data handled by the system are usernames and passwords. The database does not store any sensitive information. The security guidelines in [Lee E.] have been used extensively as a guide to the creation of the user authentication system. defined and access can be granted to system functions on a per-page basis. It will sometimes be the case that an MMC employee is temporary and requires access to only the inventory maintenance functions. To reduce the chance for mistakes and prevent malicious behavior, that employee can be granted limited access. Access to a particular page by a given class is defined in the Access_Classes table. The presence of a tuple in this table indicates that users of that class are allowed to access the page. There is no restriction on the number of roles a user many have. If any role held by a user is allowed to access a given page, then that user will be granted access. A useful capability of this system is that a user’s access may be increased temporarily by simply adding an additional class with the appropriate authorization. Tuples from the Access_Allowances table are displayed on the “User Privileges” page shown in Figure 5.7. Here, access to system components can be granted or denied to the various user classes. It should be noted that information about users is not stored in the IS. Instead, the IS accesses a department database that contains information on employees and graduate students. That access is via Web Service. This capability is a great advantage over the old system. Before, MMC employees maintained the database of user information. The burden of that maintenance that has been removed from IS users with the new system. ColdFusion environment that, if not understood, can create serious barriers for a programmer. One unusual property of ColdFusion is related to variable scoping. ColdFusion will attempt to “find” variables that are accessed without a scope. Variables declared without a scope exist in the local scope. Variables accessed without scope are first looked for in the local scope. If the variable is not found, ColdFusion will look through six additional scopes in a fixed order. If a variable with the same name is found, ColdFusion will use that variable. This leads to unusual system behavior or errors. Consequently, it is highly recommended that variables be explicitly scoped in general. Some of the challenges of this project are related to the server environment used. The web server on which the user interface resides is shared amongst all departments in the College of Liberal Arts. Due to this shared environment, developers are not allowed access to the administrative features of the ColdFusion server. Unfortunately, this means that some powerful and desirable features of ColdFusion are not available, and creative solutions must be found to deal with this limitation. The ColdFusion “custom tag” construct can be very useful. However, due to the semantics of this construct, special considerations should be taken. There are three ways in which a custom tag can be called. Assuming the custom tag is stored in the file “./myTagDirectory/myTag.cfm,” this tag may be called by any of the following methods. method is explicit and does not require the import statement as seen in Figure 6.3. Many ColdFusion developers recommend using this method exclusively. I discovered the shortcomings of the other methods before learning about the benefits of “cf_module.” ColdFusion has some unusual behaviors regarding directories and files. The tag allows a programmer to execute a ColdFusion template from within a ColdFusion template. The behavior is similar to PHP’s include function. In ColdFusion the path specified must be a relative path. This means that different levels within a site’s directory structure, the specified path will be different. There are two ways in which this can be avoided. The ColdFusion server can be configured with custom directory mappings, or the developer can establish directory mappings at run-time. These directory mappings are serverwide and are a shared resource for all developers on a server. So, if two developers would like to create a mapping called “includes,” only one may do so. These directory mappings are a poor choice for multi-site web servers when many developers are involved. In the case of the IS, these mappings were not available or practical. Runtime mappings can be established on a per-site basis and do not require access to ColdFusion administrative functions. These mappings provide developers with a uniform way by which paths can be specified within ColdFusion. Run-time mappings are new to ColdFusion 8. They are not well documented and developers are just learning how useful they can be. rapidly. To extend the object library into a generic tool, several issues would need to be addressed. This system does not support all MySQL data types. Only data types used in this project are currently supported. Completing support for remaining types would be necessary to create a versatile tool. Also, scalability has not been considered. The system is adequate for its intended purpose and work done towards scalability would not likely benefit the customer. To produce a generic tool, scalability concerns should be addressed. In particular, database and query optimization should be considered carefully if the tool is to be used for larger systems with more complex databases. Dynamic websites are becoming the norm on the World Wide Web. Systems like the IS are in high-demand. While it may appear to be a relatively simple tool, the subtleties of developing such a system are paramount. Good database design is crucial for creating systems that can accurately model business semantics. Reuse is of primary concern for this kind of development as well. If reuse is not employed, systems like the IS would contain large amounts of redundant code resulting in a system that is difficult to maintain. The IS project has provided an opportunity for me to produce a fielded software product. I now have experience dealing with a dynamic set of requirements. The term “feature creep” is used to describe the phenomena of an ever-expanding requirements set. The temptation as a developer to try to incorporate features that go beyond the core of the required functionality is considerable. Often it seems as though adding a new feature will require only a small amount of effort in addition to a system that is already of considerable scale. However, since estimation is a major problem for software projects, it is important to concentrate on developing the simplest acceptable solution before elaborating upon it. Failure to control “feature creep” can be costly. The models produced during this project have been of unexpectedly high value. Even though I am the only developer, I’ve found that I can sometimes forget how parts of it work. Without models for reference, I would have to spend a considerable amount of time to again familiarize myself with parts of the system that I had not worked on in some time. All of the time spent on modeling during this project was well spent. I’ve gained considerable experience through this project. It has been an opportunity to apply the skills I have acquired during my education to produce a product with real world value. A working system could have been produced with less effort, but my goal has been to produce a product that can be maintained and provide years of useful service. To achieve that goal, much time and effort have been invested in reuse. The result is a system that has been carefully designed and implemented with maintenance in mind.